We all love our USB drives, don’t we? You should probably be using some portable apps on your USB drive – if not, check out 100-portable applications for your USB drive here. In this post, I want to cover a few apps that will make managing your USB drive easier. In essence, I’ll talk about tools that can be used to make things easier if you’ve got a USB drive – not about apps that work from your drive. So here we go – five applications to make things easier if you’re using a USB thumb drive. If you’re working on a system that’s probably infected with viruses, you wouldn’t want to see your USB thumb drive get infected by the same – they probably have some backups of your data that you cannot afford to lose. However, if you’re in an inevitable situation where you really have to access the USB drive, do so after you install ThumbScrew. ThumbScrew can be used to write-protect your USB drive so that malware from your computer doesn’t spread to it. Download and launch the app, right click the System Tray icon and choose ‘Make USB Read Only’. Nothing could be written to the USB Drive, you’re completely protected from infections spreading to your disk from your computer. Windows does give you options to eject your USB drives – we all use that by clicking on the ‘Safely Remove Hardware’ option in the System Tray. But have you ever thought it’s too cumbersome and the list confuses you more than helps you remove that particular device? People who’ve got multiple USB Devices connected to their system will have really felt this annoyance as the hardware remove dialog doesn’t make it clear which option removes what device. Here’s the solution: Download this tiny but functional app called USB Disk Eject. Just double-click when you need to remove a USB drive and a window will pop up listing the devices connected to your system via USB. Each device is labelled clearly and legibly. Just double-click on the one that you want to get removed and you’re done. DeskDrive is somewhat similar to the above application, but it’s for keyboard junkies. Here’s a summary of the app: DeskDrive puts shortcuts to your USB drives on your desktop immediately after you insert them. Quick access. That’s pretty much it. Download the app directly from here. How many times have you browsed through those myriad of folders to launch that one particular app that you always run from your USB drive? Why not make it autorun so that the application launches immediately when you open the drive icon? Yep, that’s possible, thanks to a utility called USB Autorun. 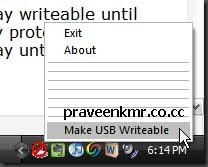 Download USB Autorun (direct link), and use the options in the system tray icon to build an autorun.inf file. 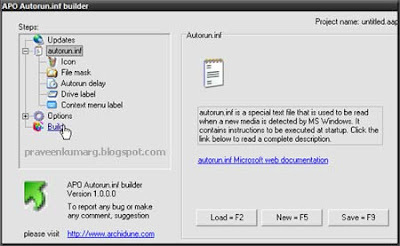 You’ll have to specify which app should be run automatically, and click ‘Build’ and the autorun maker will create an autorun.inf file that tells Windows that a particular app should be launched. No big thing to do here – you just need to specify the path where the app is present. Please note that this software is shareware, so there are some limitations. How many times have you copy-pasted those folders in Windows to back up your most important data and got fed up copy-pasting back and forth? Just relax, and get the SyncToy tool from Microsoft. 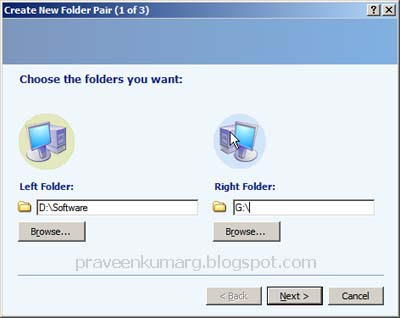 Install the Synctoy application, specify what directory should be copied to where – it’s called a ‘folder pair’ in Synctoy (here in this case, the directory where your files should be put in should be somewhere in your USB Drive) and then just press the Run button for the backup operation to take place.